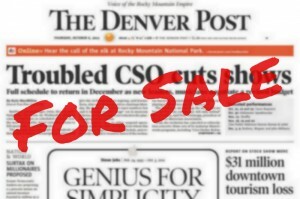 Four members of the Denver Newspaper Guild’s Denver Post units were dismissed from their jobs as web software developers Tuesday by Digital First Media. One of the members will return to his past job as a Denver Post newsroom employee and another has the contractual right to move back to his previous Post position as a technician. If the second member returns to the technician position, the least senior technician will be laid off. The other two displaced employees have no such options and were laid off. DFM has been tight-lipped about the layoffs. One of the guild members who lost his job said between 20 and 25 DFM employees were laid off in Denver, with more elsewhere in the company. -Current and upcoming staff layoffs with full names of each person—43 names total. -Staff members DFM is considering laying off with full names of each person-19 names total. -Retained staff members and the functional areas they’re assigned to. -Dead projects (Unbolt, Saxo on BANG, Design, User Testing) and retained projects (Online Saxo). -Outside services with exact costs to be cut (Bartertown, Bright Edge, Bright Cove, Crowdy News, ERA, Email Predict). -List and costs of outside services to keep. -List and costs of maintenance fees. Everybody and their dog has this spreadsheet by now. Typical outrageous irresponsible callous behavior from DFM and their CTO Bob Mason. Hope you stay on this story guild.